Durst-Andersen develops a new conceptual framework for the clarification of the relations between verbal, sentential, and utterance meaning and aspectuality. The book takes up some of the hardest problems of Russian aspect usage, e.g., the usage of aspect in the infinitive, the imperative, and in connection with negation, and demonstrates that they are fully explanable and describable in terms of this new framework without resorting to ad hoc solutions. Durst-Andersen's approach is characterized by respect for both "internal" and "external" evidence, especially from language typology and language acquisition. The book consists of thirteen chapters divided into five parts. Part One, "Background," is devoted to an examination of previous attempts in general and in Russian linguistics to classify verbs on semantic grounds as well as to an examination and critique of previous theories of Russian aspect. Part Two, "The Deep Semantics of Verbs," contains the author's own solution to the meaning shared by the perfective and imperfective forms of verbs and presents the evidence for linking purely aspectual pairs to action verbs (involving two ground-propositions paired with two gound-situations) and so-called Aktionsart verbs to non-action verbs, i.e., state and activity verbs (involving a single ground-proposition paired with a single ground-situation). In Part Three, "The Structure of Mind," Durst-Andersen sets up a mental model of events and standard statement model of processes and derives a perfective statement model and an imperfective standard statement model from the two cognitive models. 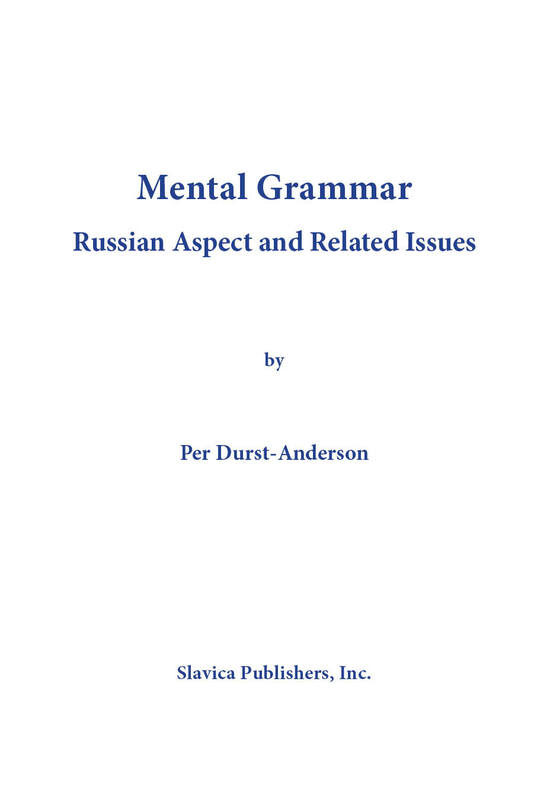 Part Four, "Inside the Russian Language," shows how the proposed grammar is put into practice and how it functions in utterances and yields statements which may be true or false, well-formed or ill-formed, and non-contradictory or contradictory corresponding to three different kinds of grammaticality and ungrammaticality. Part Five, "External Evidence," consists of the semiotic, pragmatic, and syntactic pieces of external evidence of the proposed theory. The author demonstrates that any imperative form used as a direct speech act consists of three speech acts corresponding to its preconditions, its dictum, and its postconditions, and in the final chapter he develops the basic systems of active, ergative, and accusative languages on the basis of his classification of verbs into state, activity, and action verbs. The book includes an extensive bibliography and a subject index.